The Gupta Program is a friendly easy-to-use online Brain Retraining course, for recovery from many chronic conditions. The course is mainly online, with a supporting book and floor-chart sent in the post. You also will have weekly webinars directly with Ashok, so you can ask questions, and Ashok can support your recovery. We are so convinced we can support your recovery, that the program comes with a one year Money Back Guarantee. 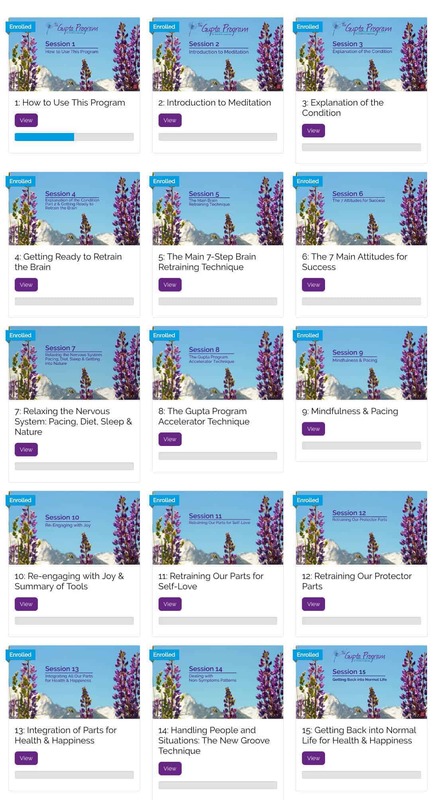 In the online membership area, there are 15 interactive video sessions, which explain all the brain retraining techniques to help you recover. You can access your account across different devices. There are also many audio exercises, meditations and supporting tools. This brain retraining program has inspiration drawn from many areas of coaching and therapy, including NLP, Meditation, Timeline Therapy, Breathwork, Parts therapy, Visualisation, Inner-Child work, and many more. We fit these tools under the banner of "Amygdala and Insula Retraining", or AIR Techniques. We suggest you sign up for the free trial to get a feel for how it works, and whether this treatment is right for you. The whole program comes with a one year money back guarantee, that if you notice no improvement after 6 months of using the program, you get a refund, no questions asked. Therefore you have nothing to lose by giving the program a chance, and to start your journey towards health and happiness! Register for our free trial where you can watch lots of videos about how to recover, and access our Member's Area.